Did You Miss the Winter Edition of Jetrader? Same place. Earlier dates. Join manufacturers, appraisers, financiers, lessors, airline personnel, fleet managers and remarketers for ISTAT Americas, 28 February - 1 March at the JW Marriott Desert Ridge, Phoenix, Arizona, USA. ISTAT Americas will feature timely aviation industry topics and engaging networking opportunities designed to facilitate discussions and deals. Learn more about special networking activities at ISTAT Americas such as the ISTAT Foundation's 9th Annual Poker Tournament, ISTAT Foundation Golf Tournament, clay shooting event, tennis tournament and more! Continue the networking before and after the conference by joining ISTAT on three social media channels: Facebook, Twitter and LinkedIn. The members-only ISTAT LinkedIn group is the perfect outlet to share your thoughts about the latest industry happenings "behind closed doors." If you're not a member of the group yet, you can click here to request to join. ISTAT has officially opened sponsorship sales for 2016 events. Take advantage of one of the many opportunities to showcase your firm, and show your support for ISTAT. New this year: All Platinum and Gold sponsors receive the benefit of being official sponsors of ISTAT Holiday Receptions, which occur 7 December 2016. Become an ISTAT global sponsor and receive a 10% discount by sponsoring three or more ISTAT events in one year (select from ISTAT Americas, ISTAT Asia, ISTAT Europe or ISTAT Reception and Chalet). Review the 2016 sponsorship opportunities to determine the package that is right for you. Click here to download. If you have questions, contact sponsorship@istat.org or +1.312.321.5169. Registration will open in February! Through five internationally reaching programs, the ISTAT Foundation supports individuals and institutions that promote the advancement of commercial aviation and humanitarianism. Committed to investing in the future of the industry, the impact of the Foundation continues to increase year after year. In 2015, the Foundation donated $600,000 globally through its five programs, supporting 65 students, as well as a number of humanitarian efforts. For many decades, regional jets have provided worthy support in the aviation industry, enabling flight connections that otherwise would not have been feasible or possible. 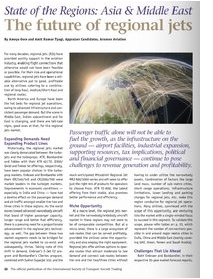 North America and Europe have been the hot beds for regional jet operations, but the scene in Middle East, Indian subcontinent and Far East is changing. There are tell-tale signs, good ones at that, for the regional jets market. If you are interested in sharing your expertise and contributing to the content of Jetrader, please contact Crystal Ligda at cligda@istat.org. The Winter edition is available online 24/7 in an easy-to-read format that works seamlessly on mobile devices and laptop/desktop computers. 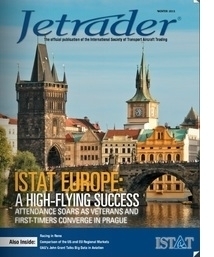 For those of you who missed the fall conference in Prague, the cover story "ISTAT Europe: A High-Flying Success," provides an in-depth report on the topics of discussion, keynote and panel speakers, and networking highlights. You’ll also find an update on regional jets in Asia and the Middle East, a Q&A with OAG’s John Grant, coverage from the Reno Air Show and much more. Check the archive for other past issues of Jetrader! Popular Mechanics Here's a fact for the next time you need to win a bar bet: How fast does a professional golfer swing the club on a fairway drive? The answer, according to Callaway Golf, is a blistering 120 mph. Phys.org The positive results – achieved through the EU-funded SNRPBBEARING project – will now facilitate the development and testing of rapidly rotating turbofan propellers for civil aviation purposes, which need advanced bearings in order to minimize friction. DW News The International Air Transport Association IATA says African airlines can expect a boom in long term demand. Despite concerns about safety and protectionism, seven African countries are among the top 10 fastest-growing markets in percentage terms. Daily Bulletin The arrival of a rather special aircraft on April 29, 1928, was hardly a non-stop affair — It was a lot like a cross-country auto trip for a family with a bunch of small children. The three men who flew in "Miss Ontario," a newly purchased monoplane, stopped at least 13 times, sometimes due to weather but mostly for fuel.